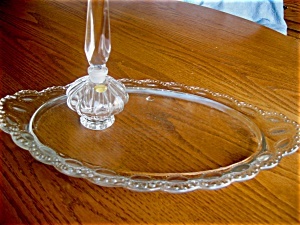 West German perfume bottle and vanity tray. Lovely collectible perfume bottle with foil label: Made in West Germany. It stands 6.75 tall and is about 2.75 wide and I believe it is crystal. It has one small surface flake off exterior top rim of bottle; nothing really visually impairing; you can't even see it without your readers on. A lovely bottle to use or just display! You also get the pretty pressed glass vanity tray to set your perfume bottles on! The tray has no chips or cracks, and is 14 long x 8.5 wide.